It is a pleasure for an Italian living in Singapore to review Italian restaurants now and then, although I am always afraid of disappointment. Basilico came highly recommended by quite a few people, so I thought I should give it a try. Located at the second floor within the Regent's hotel, the restaurant entrance and interior is spacious, sumptuous and grand, as only a hotel can offer. A very large hall is dominated by a central buffet table with dinner tables on one side and a pizza counter, a desserts counter and a wines and spirits bar surrounding it. 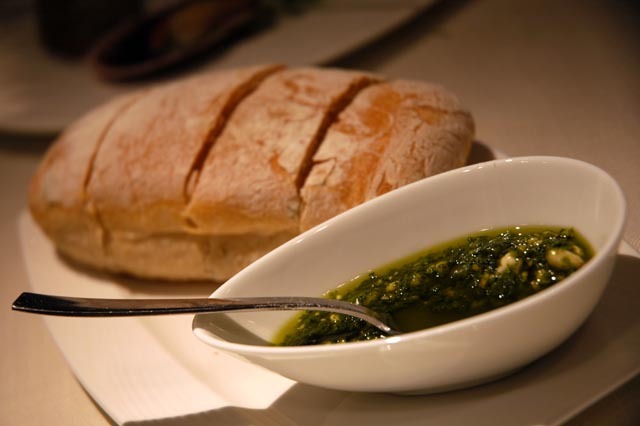 As we seated and ordered our food, we were served a warm loaf of bread with homemade pesto. The pesto was very good indeed, freshly made and aromatic, with coarse bits of pine nuts rather than too finely ground. 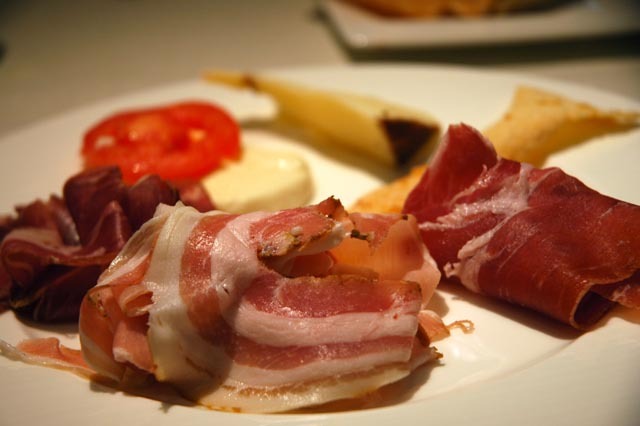 I thought the Tavolo of antipasti ($26), or buffet or starters, had to be tried and so I did. I tried an assortment of 'affettati' or hams and cheeses. I thought the 'aromatzzzato al tartufo' cheese was of particular relevance: a very interesting medium cheese with a pungent truffle smell and flavour. Out of all the hams/salami I tried, the pancetta was amongst the best you can have, and the Parma ham was lean, soft and sweet. I then tried some scallops topped with parsley sauce. They were meaty and juicy. I would say excellent, except I would have preferred them warm/hot which I realise is hard to do with a buffet. The beef carpaccio was also well done. Thin slices of tender and lean beef laid on top of a rocket salad base and topped with bits of grated Parmesan cheese. Olive oil must be added at your own discretion. Finally, the prawns and mussels were rather uninspired and had no particular 'Italian flavour'. It seemed to me that they were available simply for those who expect seafood to be present at hotel buffets. I ordered 'Orecchiette with scallops and broccoli' ($25) as my main. I wasn't incredibly impressed with this dish, although it was technically well made. 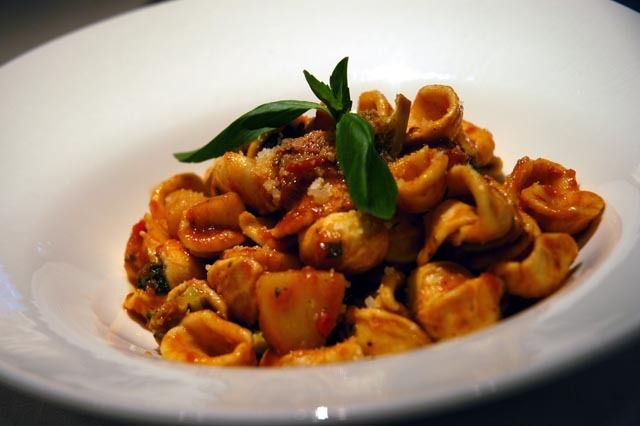 I just thought that the fish flavour wasn't a good match with the rest of the ingredients, including the orecchiette. It was a but overwhelming after a few mouthfuls. 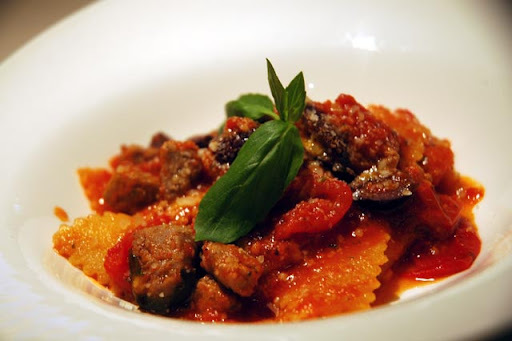 The 'Maltagliati with tomato sauce and polpettine' ($27) was definitely nicer. The homemade maltagliati were superb in texture, perfectly matched by a classic tomato sauce and small meatballs that had a very classic southern flavour. I ended my meal with an 'affogato al caffe' ($11) which was properly served with espresso coffee on the side, poured on the ice cream right in front of you. It was topped by whipped cream and a crunchy "cantuccino" biscuit, to dunk into the hot coffee. The bill came to a total of $170 including 2 large bottles of water. The service was impeccable, with an Italian waiter who was knowledgeable and attentive. 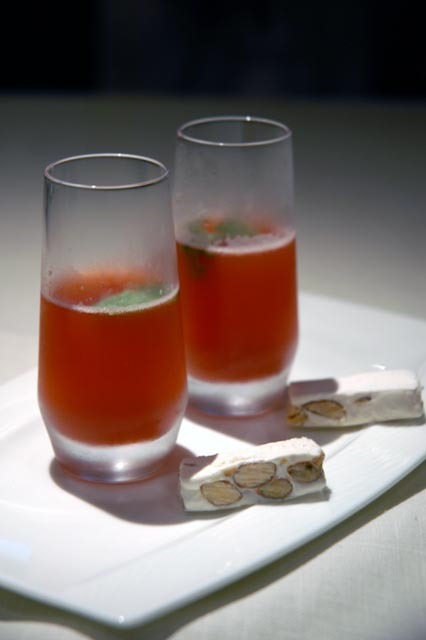 We were finally served a complimentary nonalcoholic 'Strawberry Puree with Italian nougat', which I thought was a very nice gesture. I was not disappointed with Basilico. I would be curious to try more of their dishes, including their a la carte 'antipasti' and 'secondi' to form a more accurate opinion of the quality of their cooking. 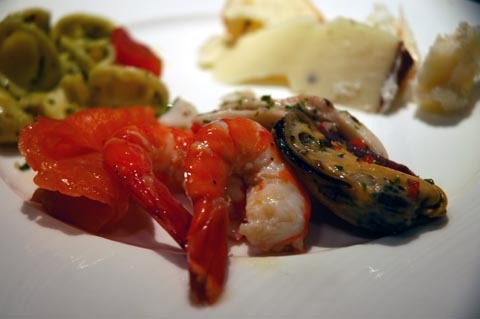 I can say that their starters buffet is good value for money as it offers a variety of quality Italian products that would be otherwise hard to access in Singapore. Their cooking style is very classic and the pastas I had were well prepared. 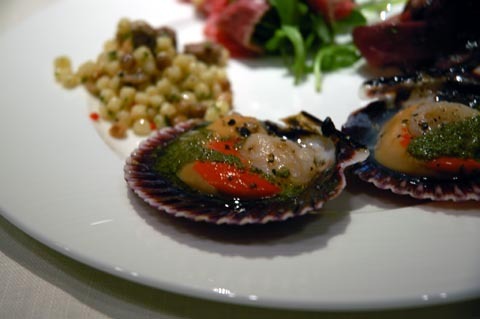 Basilico is not cheap, but considering the good service and the fact that it's located within a hotel in a prime area, prices are easily justified. Hidden behind the stairways of a pedestrian overpass is this Katong coffee shop that serves amazing Char Siu rice for only $3. 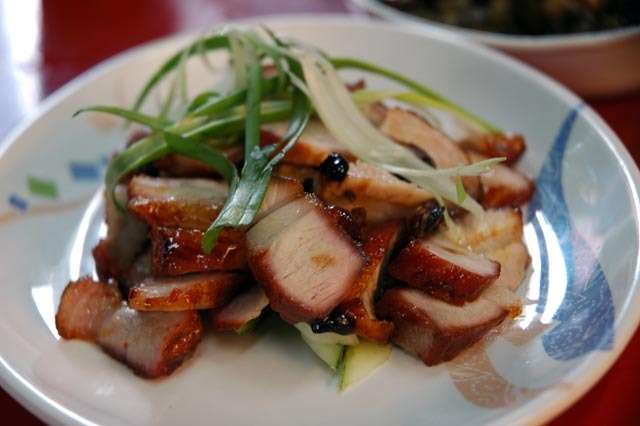 Specialised in meats, their Char Siu, pig's trotter, duck and chicken are the recommended choice. The coffee shop itself is actually very spacious, with some large round tables and air conditioning, and some smaller tables outside. The Char Siu is absolutely amazing. Sweet, tender and juicy, it melts in your mouth. 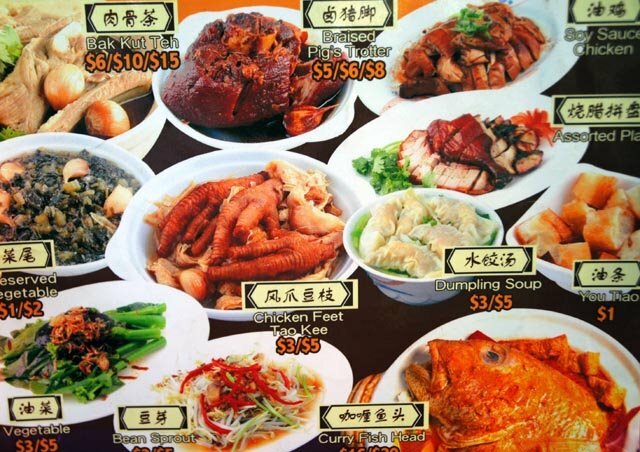 The chicken rice perfectly accompanies all their meat dishes and it's fragrant, firm and moist. 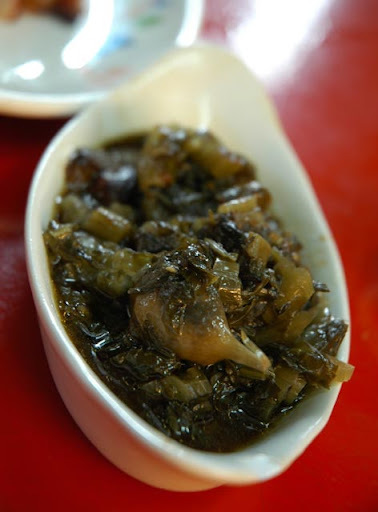 The preserved vegetables ($1/$2) are the perfect match for Pig's trotter and rice. 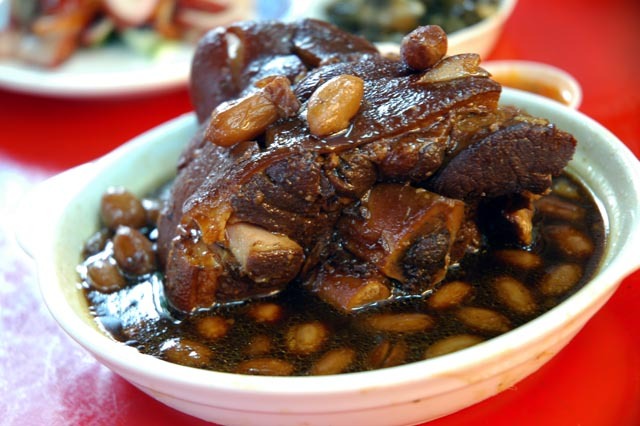 The pig's trotter is very strong in flavour and very lean once you discard the skin. It comes with juicy peanuts cooked in its own sauce. The menu is primarily focused on meats and vegetables, apart from the curry fish head. Portions are large and very reasonably priced. Their 'Soy Sauce Chicken' is served with ginger sauce as well as the usual chilly sauce. 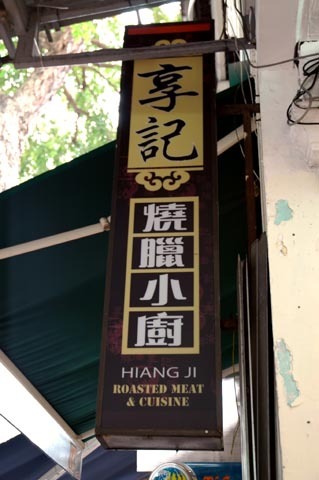 If you live in Katong you should definitely try this place. I have been a very happy Gobi customer over the past 1.5 years. Their desserts are in my opinion among the best in Singapore. Although their selection of cakes is limited to about 6 cakes, these are all so good that I have been happily going back to Gobi to purchase birthday cakes for my friends or even just to enjoy them over the weekend. Their main branch is located at The Central in Clarke Quay. Their kitchens are in Katong Mall, which is next door from me so I can conveniently order and pick up directly from there. Last weekend I had a Chocolate Therapy once again. This, together with the 'Ivory Tower', remains my favourite cake. Alternate layers of chocolate sponge and chocolate mousse lay on top of a cereal crunchy base. 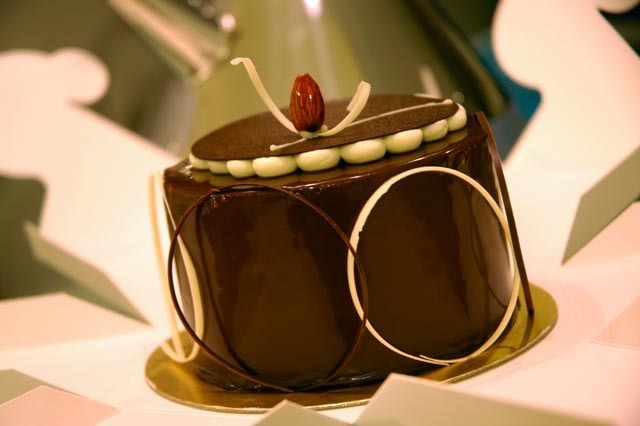 A soft chocolate sauce wraps the whole cake, topped by a light spread of whipped cream and an extra thin chocolate wafer. Overall not too sweet and not too bitter. You will definitely love this cake unless you hate chocolate, it's as simple as that. I highly recommend Gobi's cakes for any occasion. They are beautifully presented and boxed and they are always appreciated. The only drawback is that I have been irrevocably appointed as 'the official cake buyer' within my circle of friends. Chiharu is a new Japanese restaurant opened by Mr. Loh (who recently opened Braise, a stunning French restaurant located in Sentosa also reviewed on this blog). Given his impeccable track record I was particularly eager to try his new restaurant, and even more so this time as Japanese food is what I am into. 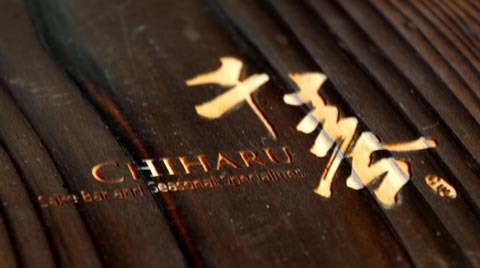 Chiharu is located on Bukit Timah road, next to 6th avenue. The dining room is spacious, with double height ceilings and an elevated dining area, an exposed wine cellar, a bar and a sushi counter. Soft lighting and a simple and dark decor based on wood, glass and metal create the feeling of a traditional style Japanese restaurant. The kitchen is supervised by the ex chef of Shiro, a reputable and exclusive Japanese restaurant that closed some time ago. 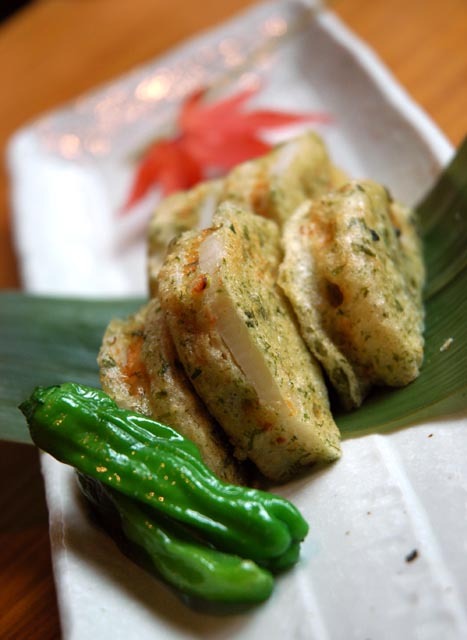 After taking a look at the menu, it became obvious that their food style is plain traditional. 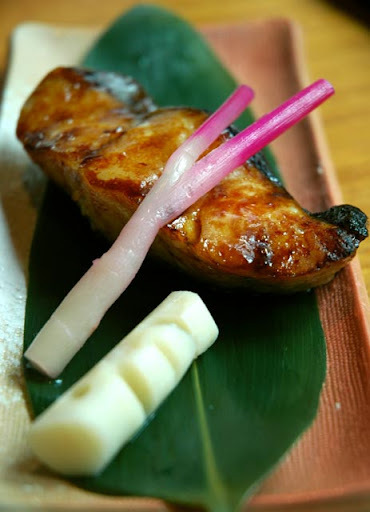 Dishes are subdivided into the main Japanese cooking techniques (agemono, nimono, yakimono, ...) and include a fairly large variety of Japanese classics. We started with a selection of Nigiri sushi: Shima Aji ($12), Kampachi ($10), Ika ($8), Uni ($20). Rice and fish were of good quality and well assembled. I particularly like their style of ika nigiri, as they slightly roasted the surface of the squid slice. The only negative note is the sushi soy sauce plates, which were so deep (like mini cups) that dipping your nigiri into the sauce is a real challenge (if you follow the proper protocol). I appreciate design, but it needs to be functional. 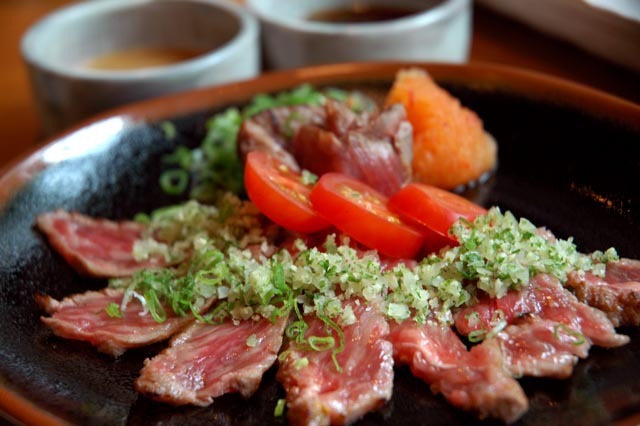 The Gyu Tataki ($45) was quite nice, if it wasn't for its price. The quantity is ridiculously small and the wagyu beef is not the best I had (I would doubt that it's actually from Japan). A dish of this size and quality would be more adequately priced at $25 at most. The Tara Teriyaki ($15, grilled cod with teriyaki sauce) was reasonably priced and very well prepared. The fish was extremely firm, moist and perfectly flavoured. The accompanying pickles were also a nice classic touch. The claypot dish Nasu Yanagawa ($15, aubergines in claypot with eggs) was mild but tasty. 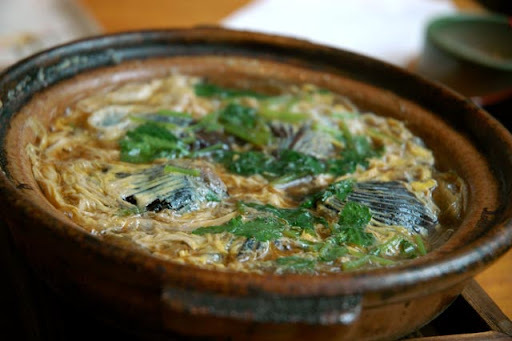 They used proper Japanese aubergines, thinly sliced to fully absorb the flavour of the broth, mixed with simmered scrambled eggs and burdock root. The Renkon Hasami Age ($15, lotus root deep fried and stuffed with chicken mince) was well presented, served with a couple of tasty green chillies and salt on the side. 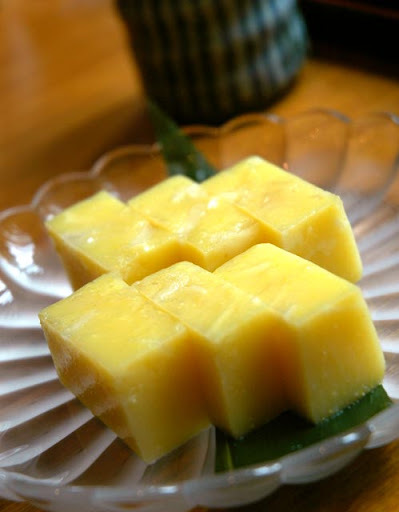 The lotus root retained its crunchiness and juices, while the coating was thin and crispy. This dish is not so commonly found in Singapore (it used to be served at Shiro) and it was an interesting find. The Kaki and azuki Yokkan was a seasonal fruit serving of excellent Japanese persimmon. 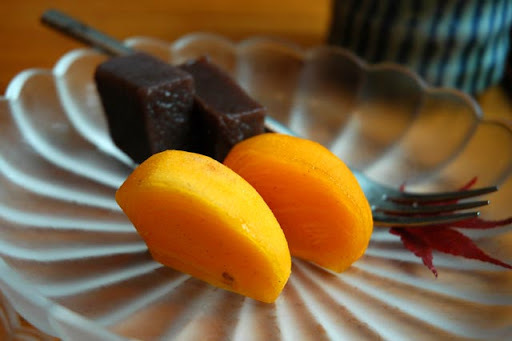 The fruit was crunchy, ripe and sweet, accompanied by a couple of cubes of red bean paste, very recommended with green tea. The most interesting dish was the Kuri Yokkan ($8), which was actually a crunchy version of the japanese tea dessert classic. Filled with bits of juicy water chestnut rather than the more rich and filling classic autumn chestnuts, it was a light and cooling way to end the meal. The total bill including tax and service charge was $180 for 2 people (including a diet coke and green tea). It isn't cheap, but it's the sort of price you would expect for this quality of food considering that the wagyu beef alone was $45 dollars. Another consideration is their service, which needs substantial improvement when related to this price range. Taking into account that they have opened only 2 weeks ago, I think Chiharu delivers an overall nice experience, although I expected slightly more originality in their dish selection. There was very little on the menu that was unique both in terms of products and seasonal dishes. They have experienced chefs and the potential to innovate and distinguish themselves, but I am yet to see that spark in Chiharu. Au Petit Salut is a chain of two French restaurants, one located at Holland Village and one at Harding Road (Dempsey Road). They have also a 'private dining' restaurant on top of the Harding Road branch for a private dining experience facing the Chef. My lunch was at the Harding Road branch, which has a relaxed and bright 'al fresco' atmosphere. There is also an indoor dining area, with wide glass windows looking onto the surrounding patio. There are two lunch menus, one 'executive' menu priced at $58++, and a regular menu priced at $30, which is the one we chose. The menu includes a starter, main, dessert and coffee or tea. Ice water is offered at the end of the meal. 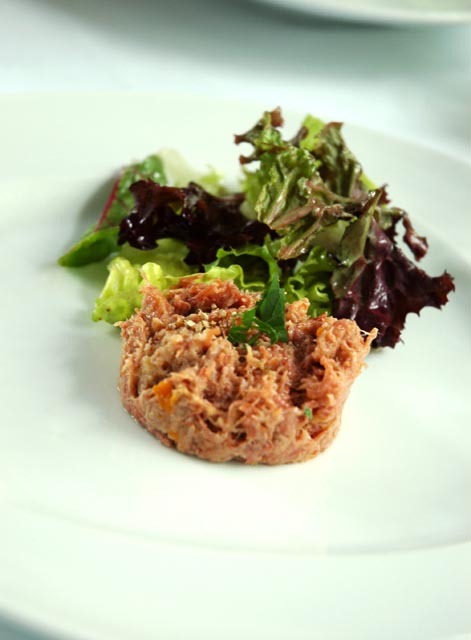 I started with a 'Homemade duck rillette with mesclun salad and walnut dressing', which tasted like tuna-like textured flaky lean meat. Slightly on the salty side, but that's how it's supposed to be. 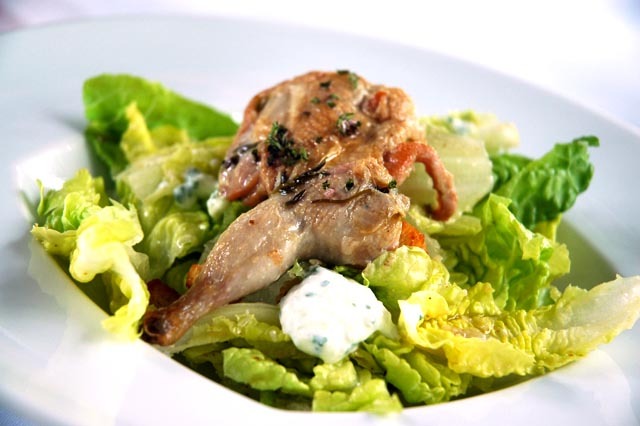 The 'Quail salad with Romaine lettuce, yogurt and cucumber dressing, croutons' consisted in a lightly seasoned and tender half quail laid on top of a typical Caesar-like salad. The quail was simple but nice, while the salad was a bit boring. 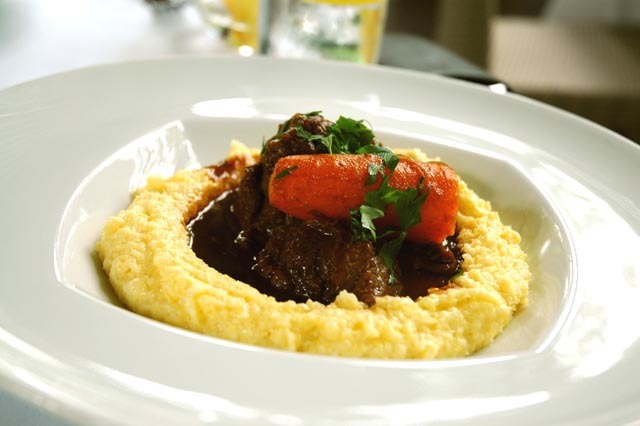 My main was a 'Braised beef cheeks Hungarian “Goulash-style’’, polenta and carrots'. I found this polenta style very interesting and gnummy. It is rather different from the traditional Italian style I am used to. In comparison, this is creamier and fluffier, probably smoothened by some dairy ingredients. The beef cheek was quite lean and tender with a clear and rich flavour enhanced by its red wine sauce. The other main was a 'Oven baked sea bass fillet with fresh mixed vegetables, light herb butter emulsion'. The sea bass was superbly cooked, with a crispy surface sealing the subtle flavour of its juicy and firm meat. The foamy butter emulsion added that extra richness to the dish, while the bed of carrots and fennel slightly lacked of a distinguished flavour. 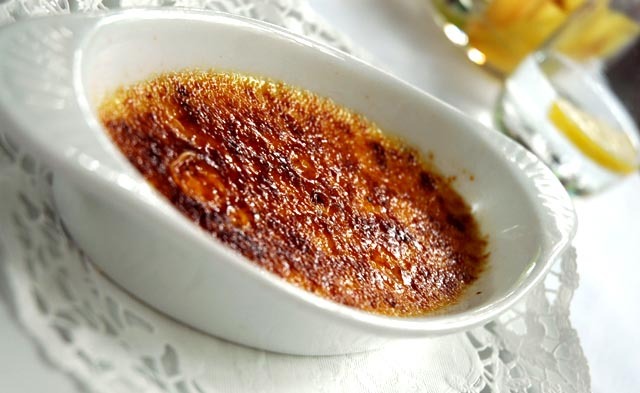 The 'Crème Brulée infused with fresh Madagascar vanilla beans ' is a classic French dessert, served in a very classic version. It was well prepared, with a visible quantity of flavoursome vanilla beans and a thin and crispy surface. The smooth flavour had quite a distinct bitter aftertaste, probably due to the caramelised surface. I was very excited about this dessert. The '“Mont-Blanc” vanilla ice cream, chestnut purée and meringue' was absolutely phenomenal. I must warn you that this dessert is not very sweet, so in order to appreciate it, you must be someone who likes mildly sweetened desserts. 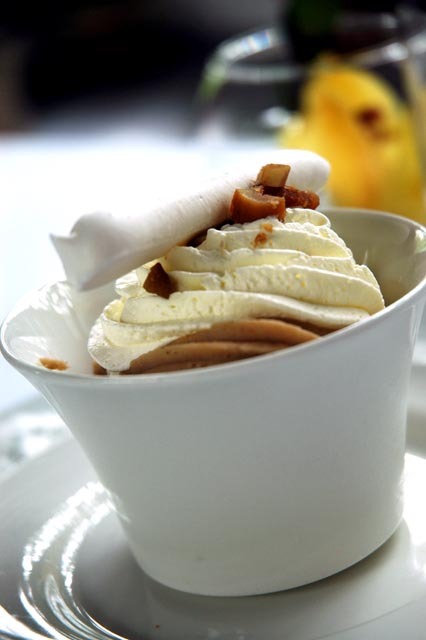 I had Mont-Blanc before, and it was always extremely sweet and heavy. The intriguing thing about this version is that it's not purely a mountain of chestnut puree'. 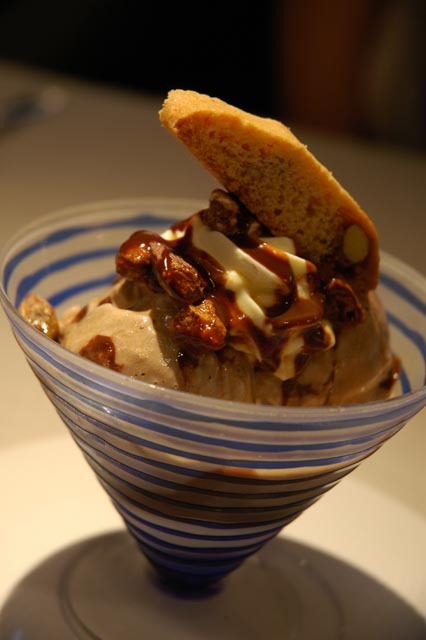 They have filled it with ice cream and topped it with whipped cream and chestnuts crumble, and more chestnuts and meringue chunks at the bottom, creating a well balanced harmony of textures. 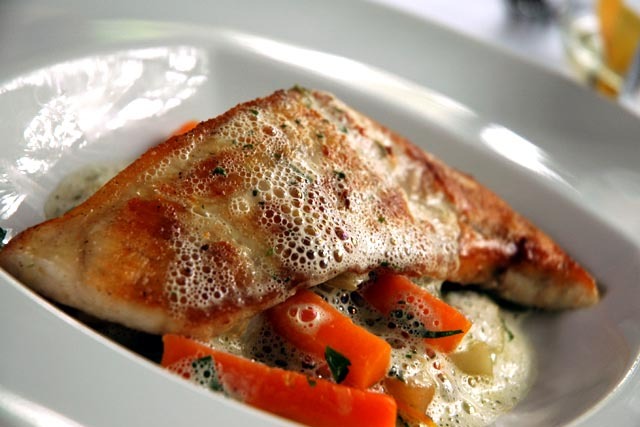 If you like 'home style' French cuisine rather than 'Nouvelle Cuisine', Au Petit Salut is the place for you. Even if the lunch menu isn't breathtaking , it is certainly a quality meal that's excellent value for money. The bill came to a total of $70 for 2 people, including a bottle of water and charges. Au Petit Salut provides a relaxed ambiance in a superbly quiet and natural setting, accompanied by very friendly and attentive service and classic, simple and well prepared food. The Terminal 3 branch of Diang Xiao Er opened 1 year ago and its location reinforces the "pit-stop for travellers" philosophy of this restaurant. It is rustically and traditionally decorated and subdivided into two areas with different deco. Their speciality is roasted duck. Their ducks are "Cherry Valley ducks" naturally bred off the lakeside, and they are marinated and roasted daily. We ordered a 10 wonder herbs roasted duck. Their duck is truly unique for its flavour and texture. 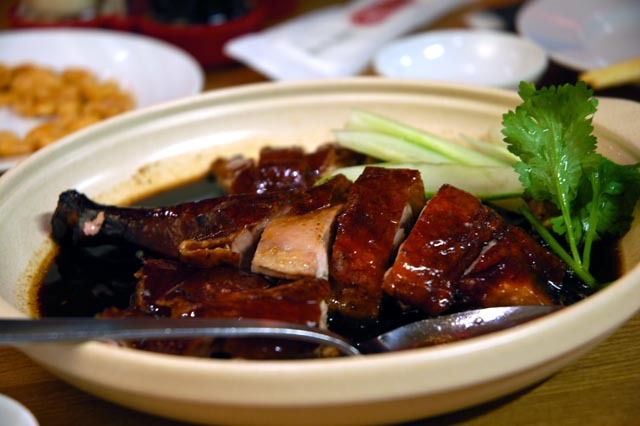 The meat is well marinated and flavoursome, non-fat and yet tender and juicy, served in abundant herbal sauce. The skin is paper thin and crispy, so you can have it without ingesting layers of fat. The portion we ordered is advertised for 2-4 people. However, in my opinion this is only enough for one person even if you have it with rice. This duck is so lean and tasty that you will feel like eating more of it than you would normally. 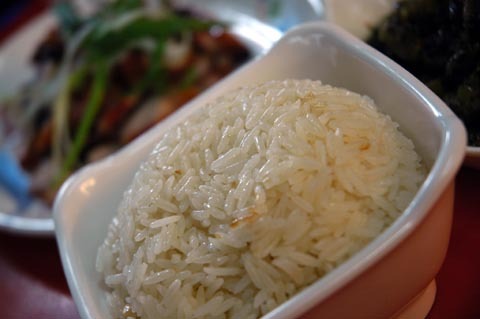 The 'superior rice' served with the duck is quite fragrant and above par with other restaurants of this price range. I highly recommend trying this restaurant if you like duck. They prepare it consistently well and you won't be disappointed.